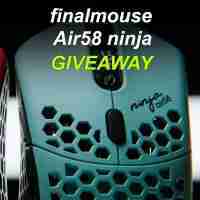 This giveaway is for the new Finalmouse Air 58 Ninja BLUE gaming mouse currently sold out on preorder! Mouse has a retail value of $89.00 and will be worth much in resell value. Again it is completely sold out in both colors.! At only 58 grams and a great sensor this is the ultimate eSports mouse. As a special giveaway for my channel I will be giving away the blue variant on Jan 31st! Giveaway is worldwide! I am not responsible for any taxes or latent costs be sure to review your countrys laws. There is not yet an ETA on shipping due to the high demand and volume I will ship as soon as I receive the item after a winner is drawn!